Hope everyone had a wonderful Thanksgiving! I am excited that the season is upon us and I am gonna do what I can to make this the most economical Christmas season ever. I am also going to try to be a little more crafty this season, God help us all. My Turkey Day ended too soon with a bout of stomach flu. To save you the details, the last thing I want to do is think about eating Thanksgiving food. Ever. So, I am on the search to find things that are non traditional with my turkey and its leftovers. Be sure to check out Skinny Taste and her Turkey Pot Pie Soup here. She is a rockstar at low calorie recipes and she is from my family's hometown of Oceanside, NY and I thought this looked really good. When I was watching The Today Show, they gave me the idea of taking my turkey and making a Bolognese sauce. I grabbed Giada's recipe and can't wait to try it!! 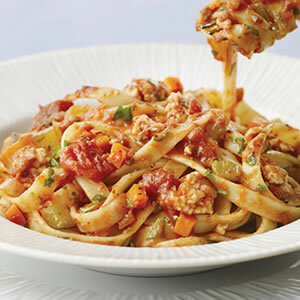 I am able to take the leftover carrots, turkey, onions and celery and make an Italian favorite with turkey. Check out her video here!! Oh my...looks yummy. I will have to give it a try.